With a chance to rise to an even record at the 2016 Rookie Tournament in London, Ont., the Pittsburgh Penguins instead lost their second game 1-0 to the Ottawa Senators in a contest dominated by both club’s goaltenders. Chris Driedger stopped all 47 shots faced in net for the Senators, while Tristan Jarry fended off 26 of 27 shots thrown his way. When Ottawa kept trying to extend their lead, Jarry was always right there to keep his team within striking distance. “I felt good,” Jarry said. “My overall game is definitely something I wanted to work on this summer, and so I’ve put in a lot of work on my own and with (Goaltending Development Coach) Mike Buckley. The only puck that got past Jarry came at 9:26 of the first period.Stephen Harper buried a loose puck after a flurry of initial saves made by Jarry. Harper’s second goal of the tournament gave the Senators the 1-0 lead they never relinquished. The Penguins controlled the majority of play after Harper’s goal, eventually leading to a 18-8 edge in shots by the end of the first period. 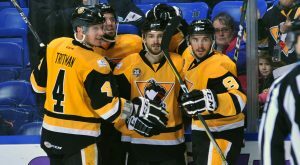 However, most of Pittsburgh’s dominance came at even strength and they ended the opening frame on a two-man disadvantage that was killed in large thanks to the prowess of Penguins’ rookie tournament captain Josh Archibald. Both teams traded power play chances in the second period, but neither squad found the back of the net in the middle 20 minutes of the game. In another penalty-filled period, the Penguins were the more threatening team – even while shorthanded – but Driedger was never fooled and gave Ottawa the victory. The Penguins look to end the tournament on a high note, taking on the Toronto Maple Leafs on Sunday, Sept. 18 at Budweiser Gardens. Puck drop is scheduled for 4:35 p.m, one hour later than the Penguins’ previous two start times.